I am not a “fan” of ceiling fans. So after 8 years, I finally replaced the guest room ceiling fan. “We” as being the electrician installed the chandelier! The Celeste Chandy seemed to be a great fit for the room. ~ ~ ~ instead of the fan blades of stained wood. However, I know their wives will appreciate the new look..
~ ~ ~ “Happy Wife – – Happy Life” !! Oh yes ~ ~ Nothing like a little bling to make a girl happy! Now off to put a bit of Christmas bling in the room! Very pretty, Shirley! I love the addition of the bling! 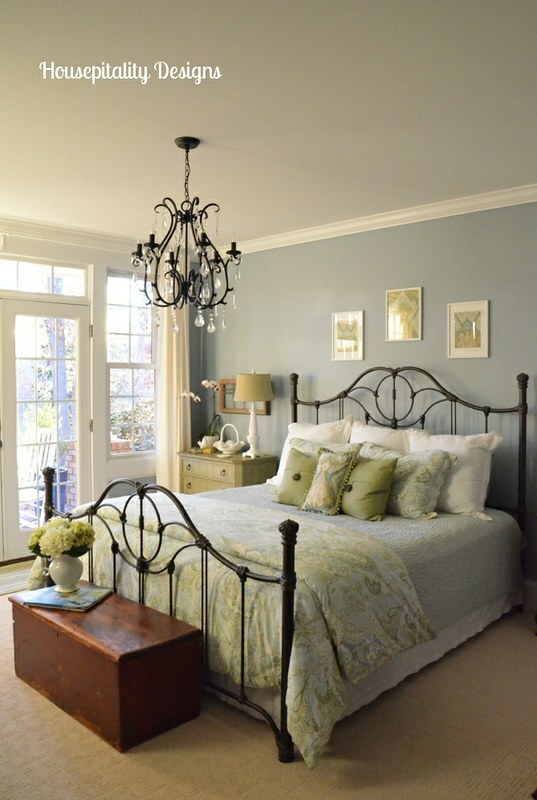 I’m loving that chandelier — and that guest room! It’s sooooo inviting. I’m thinking your happy wife guests will never want to leave! That looks so good. Now I want my new chandy. It is the perfect choice for your room. Lovely! Beautiful addition to a lovely room. What is your paint color for walls and trim? Thanks. What a beautiful guest room! I was also hoping you would share the paint color on the walls that you used. It is so soothing! Looks absolutely beautiful, Shirley. I really want to take down the ceiling fan in the hearth room and replace it with a chandelier. Maybe that will be one of our wintertime fix ups, we always seem to do this time of year. We don’t have fans in the bedroom, but the one in the den stays. Electric is very expensive on LI, a summer bill reaches $800 for 2 months, so with the cathedral ceiling, it helps. We have 2 on the covered porch too, keeps the bugs at bay and always breeze. Your chandy looks very pretty! I am sure your guests will love it. Oh that is very pretty- it looks perfect in your room. Great choice! Shirley, your chandelier is beautiful! I want to put something like that over the dining table during the reno, for the girls; but, we’re not too sure now. After cooking several meals in the kitchen/dining area, we now understand why the ceiling fans were put up in the first place…lol! Louisiana gets hot and humid; and it is obvious in the kitchen area. Maybe I can find a way to make it all work. I usually choose aesthetics over comfort, but when it comes to being hot, comfort wins. Your guestroom is gorgeous! I love the chandelier and the wall color is perfect! Great choice! Happy Wife….Happy life is right, LOL!!! I am not a ceiling fan person at all. 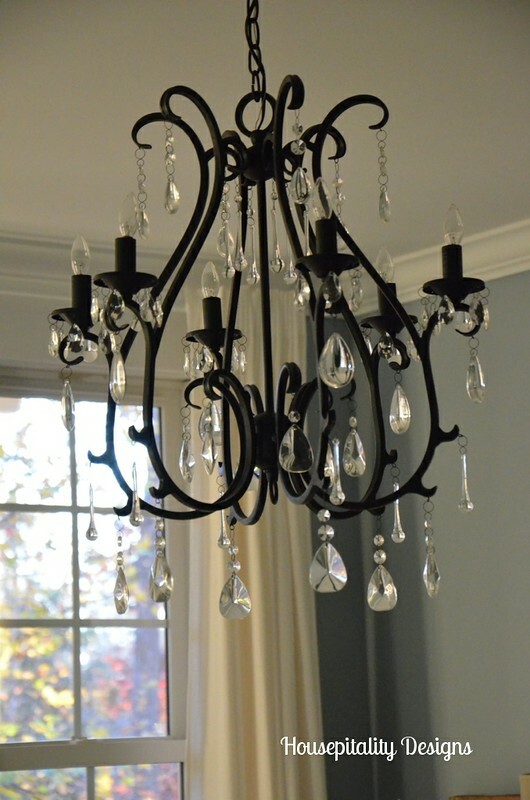 I do love my chandeliers though and this one is perfect!! Great addition. 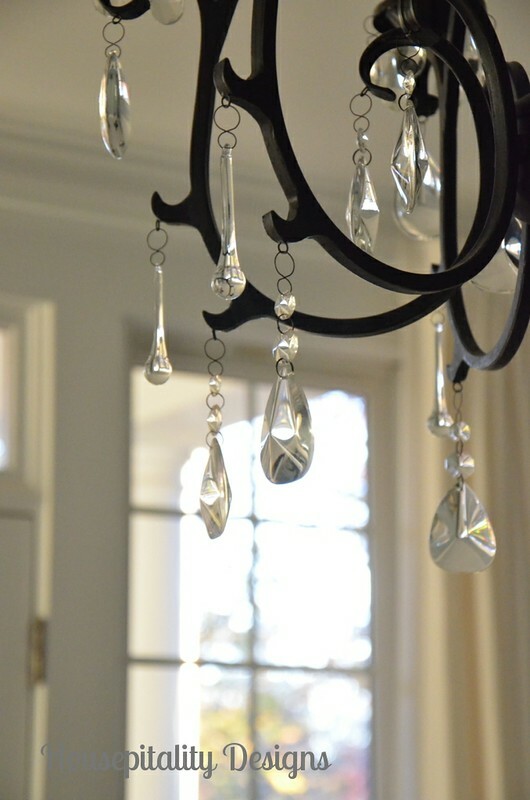 I love the chandelier, so much prettier than a fan and the love the sparkle of the crystals! Your guest room is beautiful! 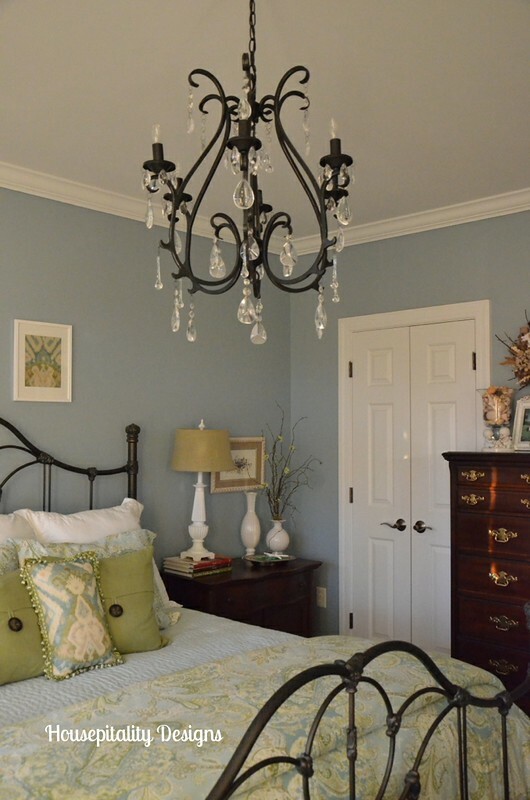 Your chandelier goes so well in your guest bedroom. I got rid of all but one ceiling fan and that is going when I find one I like. Love the bling on it. It’s beautiful, Shirley! I love it and how it looks in your guest room. We use our ceiling fan all the time so I’m kind of stuck with it. The chandelier looks beautiful. It really makes the room pretty and romantic. I know when you have guests they will love it. Shirley, it is so very pretty! Love it! 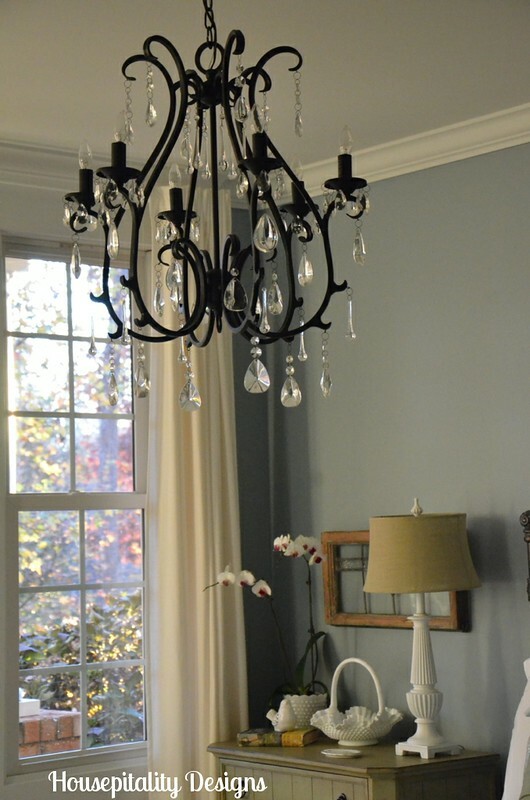 I love the chandelier, wow, Shirley, it’s beautiful and really adds elegance to the already elegant room. Oh Shirley! I LOVE it!!! Beautiful room too. WHALE of an excellent choice for that room!!!! You chose just the right one! I saw it at Pottery Barn when there for a class this past Sunday morning. (Do they do those classes where you live?Free of charge, one hour just before opening on Sunday morning, you get a 10% off coupon for anything you buy that day, and there’s almost always a great exchange of ideas among the participants. ) We have 3 chandeliers in our master suite, and I’m campaigning for 2 more that would be added to the bathroom. The bedrooms are all on the top floor of the house, so summers can be brutal without a fan to keep the air constantly moving. (Also because of those nasty and on-going hot flashes making my life a living hell all night long 🙂 ) We have compromised by using tower floor fans that are partially obscured by design. Well let me tell ya Shirley – you made the right choice! It looks BEAUTIFUL! It is so elegant but not overpoweringly so. It really compliments your space! Beautiful Shirley…love the whole room!! Martina’s recent post…Rub & Buff to the rescue! LOVE it! Been eyeing that chandelier 🙂 Looks so good, now I may have to get one! Beautiful! I would also like to know the wall color in your bedroom! Thanks. Beautiful! Such a pretty room. Hi, Shirley! I agree! I would much rather see a chandelier than a ceiling fan. Too bad everyone in my family loves to sleep under a fan. 🙁 I’m guilty, too. This room is absolutely gorgeous and that chandelier is the perfect touch! Beautiful! I love that bed…….Did you purchase it locally. I live in Sanford….right down the road. I am in looking for new furniture for one of my guest rooms. Thanks Shirley & Happy Thanksgiving! That looks gorgeous too! I am not a fan of fans, but my guests and husband seem to be:( I want bling too! I was really hoping that you would share the name of the color on the walls that you used! What a cozy guest room! Wish I was staying over in that room!